Parents are instrumental to their children’s success. Educare schools have dedicated family support staff, who along with the teachers and administrative staff, partner with parents to support their children’s learning and development. At a recent training for new family support staff from across the Educare network, participants brought in “recipes” for family engagement—what it takes to create strong relationships among Educare staff, parents and children. Before the training, participants met with family support colleagues at their schools to develop recipes that include the ingredients and process to create a positive school experience for families. Here are some examples of the creative—and effective—recipes they created. 1. Gently blend 1 cup of responsive family support staff. 2. Stir in 1 cup of empowered families. 3. Pour in one cup of active learning with children and teachers. 4. Blend one cup of open communication with leadership and support staff. 5. Mix it all together and layer it with active listening; sprinkle everyone with encouragement and pour it into an Educare mold. 1. First mix together equal parts parent, teacher, family support specialist and administration. 2. Next, add in generous amounts of trust and authenticity to build a solid positive relationship. 3. Then blend in a heaping scoop of knowledge, empowerment and support. 4. Chop away any negativity and judgment. This will make your community sour and spoil quickly, if not taken out. 5. Now pour all the ingredients into a welcoming environment and let is simmer for 0-5 years. 6. Be aware that the amount of ingredients will vary depending on the individual family’s tastes. One serving of Educare Stew will have an impact on the larger community that will last a lifetime. 1. Pre-heat school to a degree of warm welcoming. 2. Mix honesty, dependability and consistency together, then set aside. 3. Beat approachability and non-judgment together then gradually add to mixture of honesty, dependability and consistency. 4. Pour equal amounts of batter into the community then bake for desired time. 5. Check if batter feels safe to families, if not continue to bake until batter feels like a place to belong to. 6. Remove from warm welcoming and let cool to trust. Once cool, the school and family can enjoy the partnership pie. 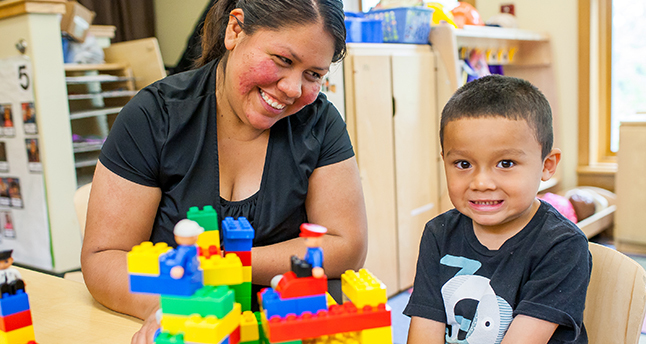 Learn more about how Educare builds strong relationships with families to support young children.